Mysterious. Elusive. Powerful. Captivating. Those are just a few of the words I've used to describe the infamous Captain Phasma, from Disney's upcoming Star Wars: The Force Awakens. From the roughly 6.3 seconds of screen time she's been given in the various trailers, Phasma remains an enigma. We know - or at least we think we know - she's an elite Stormtrooper of the First Order, and she appears to be, um, "mission-minded," to say the least. As I walked to lunch this morning, and the autumn sun warmed my face, I heard the distinct text alert from Jeremy. Much like a Wookee, and typically thinking with my stomach, I almost dismissed the sound. 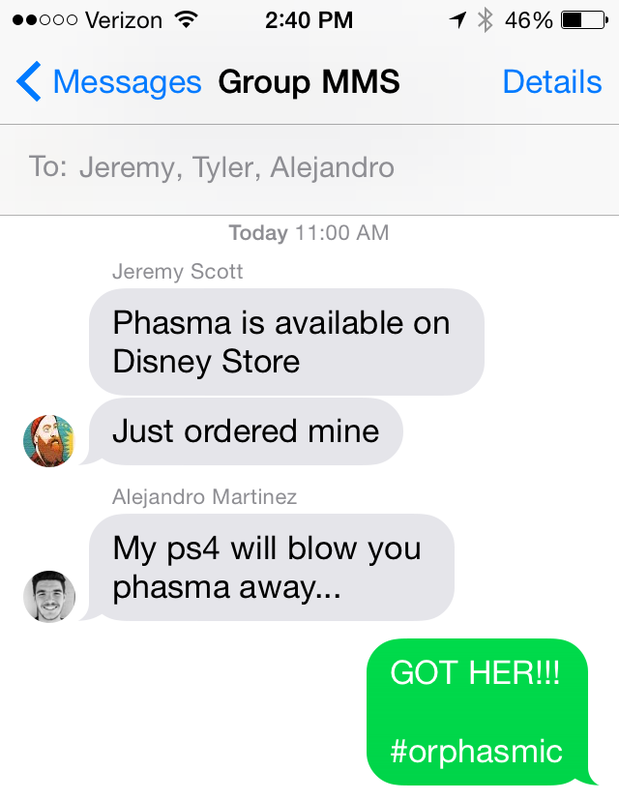 Instead, I gave a cursory glance at the text: "Phasma is available on Disney Store." It took a moment for the text to register in my brain - partly because I had checked the store earlier in the day (like I have everyday since the original launch date) with no sign of her. As it sunk in, neurons fired and my pace quickened. I broke out into a sprint. OK, it was more like a solid trot, but at this age it felt like sprinting. Quickly, I caught up to Tyler, and as I passed him I muttered something like, "Jeremy texted. She's available!" (Notice I didn't even have to mention her name. It was understood, like a math formula: Her = Phasma = Happiness). Tyler abruptly ended his conversation with a colleague and the two of us jogged to the nearest computer, Tyler worriedly realizing he didn't have his wallet with him. "I got you," I said. "But we can only buy one at a time," he said. "Then we'll make two purchases!" I exclaimed. "C'mon! We've go to get her!" (Interestingly, at no point during this process did I think my actions as a professional in his mid-40s seem the least bit out of place). Then, she appeared. Still, fearful at getting Disney's obnoxious "Gorsh!" error, I worried that there weren't any units still available. So, I nervously clicked the "Add to Bag" button and waited. When the "My Bag" icon indicated she had been added, it was a race to fill-out the billing and shipping info, so we could place a second order. What about you? What collectible or merch has been eluding you? Share your story below!